Here at aShortChronicle we just want to say "thank you" for a great year! 2013 seemed like a marathon battle for good government. In many ways it took a toll on the local activist community. In other ways it made it stronger. Personally, running for office was a great life experience even though it did not quite work out. 2014 promises to be a fast paced year with the possibility of multiple bruising primaries in the spring and North Carolina being the center of national attention with the US Senate race next fall. It will be fun to watch. This past 12 months we've covered and participated in some great stories with your help, and we look forward to ruffling a few feathers in 2014. Our local pols will give us plenty of opportunity, I am sure. Before then however, have a safe and fun New Year's Eve!!! cannot stand is the saying. While I don't think that saying really applies to the Republican Party here in North Mecklenburg, things are going to get very messy over the next few months. Tuesday saw the announcement of a new group forming in the area called Lake Norman Conservatives. The group's first event is ambitious - a candidate forum for the US Senate race. Three of the five announced candidates are apparently confirmed, but that list does not include Speaker Thom Tillis of Cornelius. I'd be surprised if he does. This new group has its genesis in the controversy over toll roads - a controversy that has its roots in the actions of our elected officials - primarily Republicans. (See here, here, and here for just a few examples.) Those actions were bound to ultimately end in this result - a division within the ranks of the conservative movement in the area. Regardless of what happens from here on out, people need to remember where the blame really lies for that. There are good, committed people on both sides of this dividing line, and I hate to see them lining up against each other. Wednesday saw the entry of recently re-elected Cornelius Commissioner John Bradford into the NC House 98 race to represent North Mecklenburg in the NC Legislature. This is the second time in two election cycles where a Cornelius elected official announced plans to run for a higher office immediately after a municipal election cycle - the other time being when then newly re-elected Mayor Tarte jumped into the primary for NC Senate 41. Tarte was successful and maybe Bradford will be too. However, if I was a Cornelius voter I'd be pretty annoyed with my Town Board repeatedly being seen as a stepping stone to higher office. Local businessman Joshua Dobi, expressed concern if Bradford were not to be re-elected. “Considering the amount of turnover we have had on the Commission this year I would be very worried if John Bradford were not to be re-elected to the Cornelius Town Commission. His service is vital to the health of our town government. Apparently, Bradford does not share that same "worry". Expect to see comments coming out of the Bradford camp like "this just came up", or "people started asking me to run" etc, etc. Do not believe them. The rumor that Bradford was thinking of running has been circulating for a while now. The first bit of evidence received here was less than ten days after the last election. Also, comments by the other announced Republican in the race, Lynette Rinker, make it sound like she might have had the inside scoop a while ago. In hindsight, her references in her campaign announcement to being "a full-time legislator and working for you will be my only job” may be an attempt differentiate herself from Bradford who owns a real estate management business. This race will be interesting to watch, but frankly, as a conservative, neither announced candidate excites me all that much. The biggest local issue this year has been the widening of I77 with tolls and both of these candidates come down on the wrong side of that issue. They are in the same camp as the person who they are trying to replace - Speaker Thom Tillis. It's hard to see many of the local activists I know supporting either of them enthusiastically. What would make it more interesting is if a third candidate jumps into the race. I can think of a few people who I'd like to see, but unfortunately, there is no chatter, swirl, rumor or innuendo to report on the possibility of that. New idea to avoid tolls on NC's highways...too little too late? Recent days have seen some interesting comments regarding transportation funding from NC Senator Jeff Tarte. Here's one from his Facebook page. The comments revolve around funding sources allowing the state to avoid tolls on our roads. I've got to say, there is a good bit I like about this idea of dedicating new revenue to these seemingly intractable problems. It's out of the box thinking which is always a good thing from our elected officials. I particularly like the notion of dedicating revenues from physical, State resource like oil, gas, and wind(?) to physical, State resources like infrastructure. It reminds me of something the Town of Davidson did recently where it dedicated money from selling some right of way for a gas pipeline towards future improvements for town greenways. For a long, long, time now we've all been told that tolls were the only way we would ever get the widening of I77 done in the next few decades. 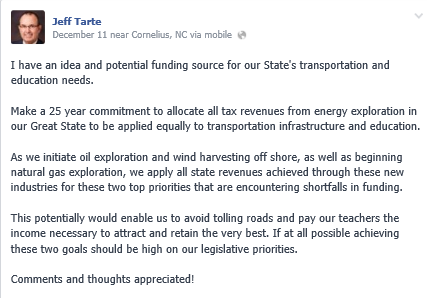 Is Senator Tarte's idea really a solution that allows us to avoid tolling a widened I77 in the next few years? At this point the only way for us to know would seem to be the demise of the HOT lanes plan before signing a 50 year contract next spring. Senator Tarte has not been what you'd call a strong opponent of the HOT lanes plan for tolls on I77. He has not been out there fighting its implementation. If this idea is workable, it would have been a great one to throw out there and fight for as the HOT lanes plan was being steamrolled forward. So in some ways, this idea may be too little, too late. But in the off chance it sees the light of day at the Legislature, let's take it at face value and look at what challenges it might encounter. Specifically, is there enough money to make a difference and who else in state government wants to sink their teeth into it? "North Carolina’s Oil and Gas Conservation Act currently sets the state’sbseverance tax for natural gas at 5/100 of a cent – $.0005 per 1,000 cubic feet of gas. The revenues can only be used to pay the costs of administering the law. North Carolina has one of the lowest severance taxes in the nation. With the exception of those states that do not assess any severance tax, North Carolina’s tax rate was the lowest of all states for which severance taxes were identified as part of this study." Those same industry lobbyists that are promoting energy exploration will likely fight any increases to these taxes and fees. Putting forward a bill recommending the significant increase of this tax to compare with that of a state like Texas would be a real indication that the North Carolina is serious about creating an income stream to meet the scope of these problems. 1. Provide funding for any continued work on the development of a North Carolina regulatory program for the natural gas industry. 2. Address the distribution of revenues from oil and gas excise taxes and fees to support the oil and gas regulatory program, fund environmental initiatives, and support local governments impacted by the industry. These recommendations were codified in S76 - Domestic Energy Jobs Act. which passed earlier this summer as the HOT lanes debate went into high-gear locally. This bill dedicates energy industry revenues to such things as preserving "cultural heritage and quality of life". Good things to be sure, but probably not things in line with spending money on roads or even education - meaning implementing Senator Tarte's idea would require additional legislation. And the DENR is not the only one that has it's eye on this pot of money. Our State's Commerce Secretary also want's a piece of it to create a "slush fund" similar to Texas's for economic development incentives to recruit businesses. I commend Senator Tarte for throwing out ideas. It takes significant ideas to make significant changes. However, for this idea to work it will require a huge effort to corral the needed revenue and then fight off the sharks that will certainly be circling. There are a lot of great things about living in a small town like Davidson and being able to participate in your local government in an up close and personal way is one of them. As the first of what will be a regular feature here at aShortChronicle, here is video of tonight's swearing-in ceremony for Davidson's newest batch of elected officials. Call it our little contribution, free of charge, to openness and transparency in local government. We won't be able to get every public meeting on tape, but we'll try to get the important ones! NOTE: You may need to turn the sound all the way up. The farewell to Commissioner Connie Wessner who was not re-elected this term. The swearing-in ceremonies for Mayor and Commissioners. With a nice small-town touch, these were all done by the family members of each official. The election of Beth Cashion as Mayor Pro Tem and the assignment of commissioners to various nominating committees..
After being circulated by a reader, last Friday's post on the Mayor Pro Tem selection for the next Board got a response from Town Hall. Actually, it received multiple responses. Commissioner Graham said there had been no discussion of anyone other than Beth Cashion. Mayor Woods was "dismayed" and asked if my "goal" was "to foment confusion and distrust". He then asked that I retract the post and "allow the Town Board to do its work for the citizens of Davidson." In response to those comments here's the update to Friday's post. Word has come in from Mayor Woods and Commissioner Graham that they will support Beth Cashion as Mayor Pro Tem. Very glad to hear that! They said they had not discussed otherwise and what I printed was incorrect. In hindsight, I probably should have asked them directly to verify before printing this piece. My concern was that the town follow tradition, and so I posted what I had heard. I am glad I was wrong. I'm more than glad to hear that there won't be a controversy around the subject tomorrow night - a night that should be a celebration for all involved. That may not sound like the desired retraction they were looking to see, but I am truly very glad that the Board will go forward according to tradition. As for my goal being to "foment" anything, nothing could be further from the truth. My goal as always is to pursue open and transparent government wherever possible. I don't think it should surprise anyone that people may be thinking more non-traditional actions might be in the offing. I for one am very glad to hear that apparently is not the case. This blog reports what I come across in the daily discussions I have with people in town and elsewhere regarding local politics. I don't "make things up" - an accusation that was directed at me today by one of our electeds. If people disagree or don't like what they hear, and that includes elected officials, they are more than welcome to submit comments. I'll print them. Two seemingly small things are on the agenda for Tuesday's Town of Davidson Board meeting, but of course small things can have big impact. What makes these interesting is that the first of these occurs with the current/outgoing Board and the second after the new/incoming Board is seated. Commissioners Jim Fuller and Rodney Graham serve as the Board members on the current nominating committee made up of Mayor Woods, senior Town staff, and chairs of the current committees. It would serve the public interest and the ideal of government transparency if they did the right thing and asked to have this pulled from the consent agenda and voted on separately at tomorrow's meeting. I'm sure the folks nominated are qualified. I'm sure they will do a good job and know the town well. Most will likely have completed the Town's Civics 101 class where they will have been indoctrinated in the "Davidson Way". The only question is will they have been selected to truly represent a cross section of town residents. Having their nominations buried in the consent agenda does not let the public know that. The second and not-so-small small item to be voted on comes after the new Board is seated tomorrow night. That's the new Board meeting schedule. As discussed in the previous post, the new Board will vote on the Mayor Pro Tem. However, after that they will vote on their meeting schedule. One item that will improve town transparency actually appears to not be on this proposed meeting schedule. That's the in-home meetings Commissioners have been having on the 3rd Tuesday to ostensibly discuss "team building". However, the "special meeting" in March of last year seemed to be discussing actual Town business. It was no longer just a wine and cheese fest but an actual meeting that really should be held in Town Hall. While these in-home meetings do follow the letter of the open meetings law and citizens are invited. They do not seem to fit into the spirit of being "open". How many people are going to actually feel at ease going into someone's house? Not too many, would appear to be the answer from reviewing the meeting minutes. Let's hope removing this meeting is a sign of good things on the horizon from the new Board when it comes to being open and transparent. UPDATE: The Advisory Board appointments were added to the agenda Monday after this post. See here for the list. UPDATE #2: At Tuesday's Board meeting in an updated agenda, these were pulled from the consent agenda prior to the meeting and voted on separately. They passed unanimously. A rumor is swirling that an effort may be afoot to prevent Commissioner-elect Beth Cashion from claiming the Mayor Pro Tempore spot when the new Town Board is seated next week. Tradition has it that the highest vote getter from the Board is selected for this position. If such a move is made it will be a sign of discord to come and a lack of acceptance on the part of the remaining incumbent Board members and Mayor Woods regarding what actually happened this past election cycle. Let's all hope for the sake of our community that it does not come to that. 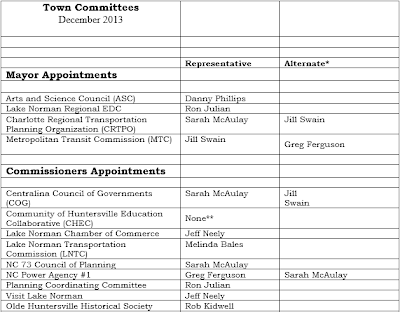 I certainly hope that they would not put us on the same discordant path that Huntersville took this week with its new Board - starting off on the wrong foot and diminishing the role of certain commissioners. So, you may be asking what is the Mayor Pro Tem and why does it matter? As you can probably imagine, there is a little more to it than that. The Mayor Pro Tem serves as the "backup" when the Mayor is not available. Ostensibly, the Pro Tem's main responsibility is to run the Board meetings if the Mayor is unavailable. However, this person would also go to events and meet with people as the Town representative if the Mayor could not - making the Pro Tem position a little more important than just a seat filler. The Pro Tem at times can become the "face" of the Town. For a Town leadership that absolutely craves solidarity and abhors any type of disagreement, having the number two spot filled with a newcomer to the Board, someone who will have ideas independent from the Mayor's, is not desirable. During the recent campaign, candidate Beth Cashion repeatedly faced a question designed to embarrass her. Every forum except for Summers Walk asked whether candidates used Mi-Connection. This question even came up at the last minute to be included in the DavidsonNews.net candidate profiles. The question implied that not subscribing to the town-owned cable company somehow should disqualify someone from public office. The question implied that if a new candidate was not a subscriber they somehow did not support the town. Beth Cashion was the only candidate who had to answer that question with a "no". She answered it well. She answered it repeatedly. And apparently, the voters appreciated it - giving her by far the most votes on election day. My guess is voters cared more about electing someone who won't get us into obviously bad decisions like Mi-Connection rather than if that person spends their household money to bail out the politicians who do. Beth Cashion absolutely deserves the Mayor Pro Tempore spot, and her fellow Board members should unanimously elect her to that position on Tuesday. UPDATE 12/9/2013: Word has come in from Mayor Woods and Commissioner Graham that they will support Beth Cashion as Mayor Pro Tem. Very glad to hear that! They said they had not discussed otherwise and what I printed was incorrect. In hindsight, I probably should have asked them directly to verify before printing this piece. My concern was that the town follow tradition, and so I posted what I had heard. I am glad I was wrong. I'm more than glad to hear that there won't be a controversy around the subject tomorrow night - a night that should be a celebration for all involved. After a tough campaign for Mayor, one that became personal and fairly nasty at times particularly around the widening of I77 with HOT Lanes, Mayor Jill Swain was quoted in the Lake Norman Citizen as saying "my next step is to start working to help Huntersville heal from all the negativity generated in this campaign." Things started off well for the newly minted Huntersville Board on Monday night with the unanimous selection of Commissioner Melinda Bales to serve as Mayor Pro Tem. Bales received by far the most votes in the election for the Huntersville Board being the only candidate to break 3000 ballots. As tradition has it she became the Mayor Pro Tem serving as Mayor Swain's "backup" even though there are other commissioners with longer tenures on the Board. The second vote for the new Board ended in a tie when Mayor Swain put forth a recommended set of committee appointments that clearly stacked the deck with commissioners from "Team Swain" (Ron Julian, Sarah McAulay, and Jeff Neely) receiving 7 assignments including all of the most important and influential posts. "The Others" on the Board (Melinda Bales, Danny Phillps, and Rob Kidwell) received a combined total of 3 spots. When it came time to vote on the assignments "Team Swain" and "The Others" split 3-3 with Mayor Swain casting the tiebreaker in favor of her picks. See below for the details. Mayor Pro Tem Bales gets the LNTC post while Sarah McAulay gets sent back to the CRTPO (formerly MUMPO) post. While the LNTC sounds important, the real transportation decisions for our region are made at the CRTPO. Instead of sending the highest vote getter for Huntersville to CRTPO, Mayor Swain chose to send the person who tried to shut down debate at that group on the all important widening of I-77. See this video where Chairwoman McAulay prevents members of the public from speaking at the public hearing on widening I-77. 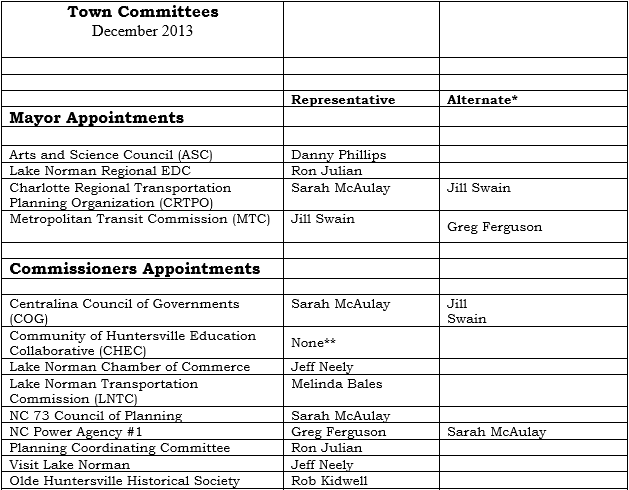 Commissioners Phillips and Kidwell get the Arts and Sciences Council and the Huntersville Historical Society posts respectively. They received endorsements from the WidenI77.org and Commissioner Kidwell specifically thanks that group on his Facebook page for their support and tells the Lake Norman Citizen regarding I77 "I think it clearly was the issue of the toll lanes," he said. "I believe that was the major factor in me getting elected to the board and I hope this is something we can talk about as a board and get settled." This is the last in the series on Davidson's recent election season, and it's time to take a quick look at how money was raised and spent. It's safe to say that this election was probably the last where most candidates go into it intending to spend little or no money. That is certainly a change for Davidson, but it's not necessarily a bad thing. It will mean that candidates need to spend more time on campaign finance reports in the future. But that will also mean that more transparency will be required in how money is raised and spent. In the past, Davidson candidates almost always signed what's called a Certification of Threshold form at the Board of Elections stating that their campaigns would stay below the legal limit of $1000 eliminating the need for detailed campaign finance reporting. It was a very convenient way to file since small town elections really don't absolutely require large sums of money. This cycle started out much that same way. With only Stacey Anderson and Beth Cashion starting their campaigns intending to spend more than $1000, all of the other candidates, myself included, intended to spend less than the threshold. By the end of the campaign however, all but Commissioner Jenest appear to have raised and/or spent more than the threshold. This is based on reporting done by DavidsonNews.net as well as a review of the campaign finance reports on hand to date at the Mecklenburg Board of Elections. Candidates used consultants (possibly a first for a Davidson election) - Challengers Stacey Anderson and Beth Cashion used local consultants to support campaign marketing. Commissioners Jim Fuller and Connie Wessner used an Asheville based company to support mass mailings. The least effective spending? Commissioner Fuller also purchased a $100 add in the Davidsonian published by Davidson College. Based on a quick review of the voters from the College zip code 28035 (yes, there is a College zip code!) only 6 college students voted this election. So the obvious question is why did so many candidates, particularly the incumbents, go into the election intending to spend little to no money, but end up spending more than anticipated? Some will say that all this is a bad thing - seeing money coming into our local elections as just another sign of a bygone era. However, in a counter-intuitive way, it may mean more candidates feel able to enter the contests for our elections. Here's why. While most candidates did in fact self-fund their campaigns, I proved that a candidate who could not fully self-fund a campaign could still be competitive even as money became a tangible part of the election process. Yes, I had to raise some money. However, Davidson is a generous town, and I was overjoyed to be able to raise enough for what I needed. Could I have raised and spent more? Would it have made a difference? "Yes", and "probably" are the best answers to those questions. Honestly, I think that I ran out of time before I ran out of money, but that's the thing about elections - you always have too little of both. 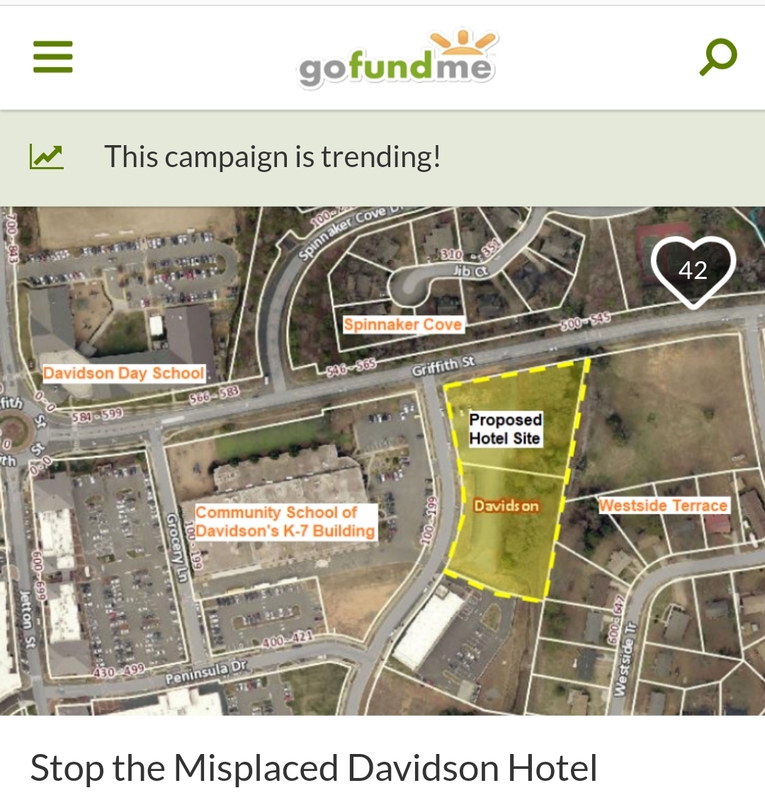 Good things keep happening for the Davidson Community Garden. 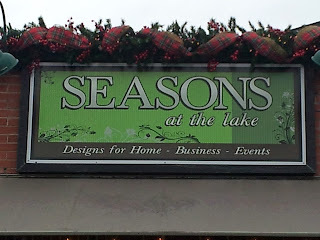 This past week Seasons at the Lake held it's grand opening at its new store just around the corner from the garden. 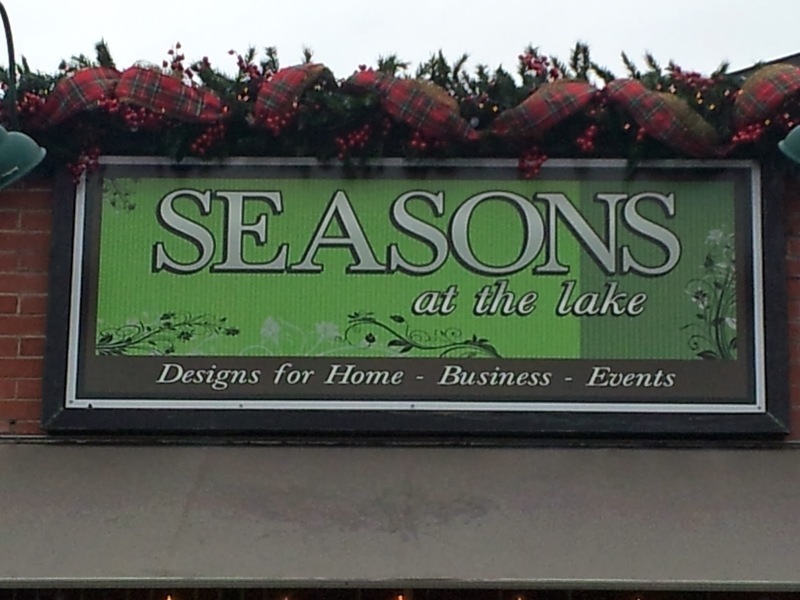 As part of the festivities the store offered to donate 20% of proceeds from all ornament sales during the event to the DCG effort. As a sign that the garden has truly become a recognizable and integral part of the Village area, this donation truly came out of the blue. When asked how it was decided to make this gift, owner Gary Skaggs simply said that he sees the garden every day when driving by and had noticed the regular groups of volunteers on Saturdays. He thought this donation would be a nice way to contribute. ...and the volunteers kept coming this weekend. 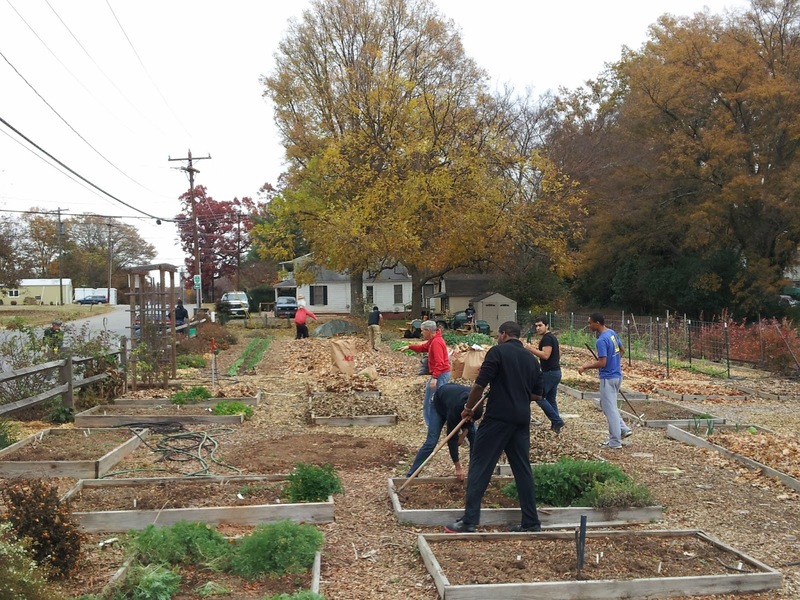 While the regular volunteer meetings officially ended November 16th, it was great to see a large group of Davidson College students out this past Saturday helping get the garden in shape for winter. Members of the Alpha Phi Alpha service fraternity and several other students showed up to help get garden beds mulched and turned. Come springtime, these efforts will have the beds ready to produce again!!! Public polling of our local municipal elections is a rarity. Polling costs money and takes time - both things that are in short supply when it comes to town elections that see relatively little money raised by candidates and the core campaign period spans only about 30 days. But what if someone was willing to take the time and do it for free? What if the person coordinating the polling effort actually had a national reputation in the field of analyzing elections data? What if the survey could be done with a level of scientific accuracy comparable to the national surveys we all see and hear about in the daily news? Would it be worth it then? Yes, absolutely! In Davidson this election cycle, just such a survey occurred in the run up to the election. Conducted by Assistant Professor Josh Putnam's Public Opinion class at Davidson College, a survey was completed in the week before election day. If you follow politics, you may have heard of Professor Putnam, he writes the Frontloading HQ blog and made a bit of a name for himself during the 2012 election cycle - being one of only 3 nationally known "pundits" to nail the Electoral College results in the election for President of the United States. Scaling back a bit from the national stage, he and his public policy class conducted a survey during the last week of October hand delivering surveys to randomly selected registered voters, picking them back up, and then tallying the results. Can you say labor intensive!?!? The survey covered not only the election, but also some of the policy questions facing the town. It was remarkably balanced in how close it came to the actual demographics of Davidson - something harder to do with a small population where small numbers can make big percentage differences. The margin of error was +/- 6.3%. That's a little outside the bounds of what larger surveys tend to achieve, but still close enough to allow for valuable information to be collected. It was conducted as a survey of registered voters, not 'likely' voters. Everyone says they will vote, but most still do not. - 75% of survey respondents said they planned to vote. That meshes with everything I heard while going door-to-door where just about everyone said they would vote. Davidson's actual voter turnout? Less than 25%. People still don't like the idea of HOT Lanes on I77. - After a full year of selling the plan to expand I-77 with tolls by installing new HOT lanes, supporters failed to move the dial in their favor at all. 56% of survey respondents said they did not approve of the plan. Survey results from the National Citizen Survey published in March of 2012 had the number opposed at 53%. All of Davidson's incumbents supported HOT lanes. All of the challengers opposed them to varying degrees. Mayor Woods's level of support lower than his vote totals would imply. - 56% of voters approve of the way John Woods handles his job as Mayor. While he received 95% of votes cast this election, nearly 25% voters left this race blank or wrote in another candidate on their ballot. These poll numbers imply that a fare number of people voted for John Woods simply because he was the only name on the ballot. Interestingly, his "approval" number in this poll comes in much closer his voter percentage in the 2011 election when he did have a challenger. In that election he received 59.67% of the overall vote while actually losing Precinct 127. The race was tight all the way to the end. - Conducted in the last week before the election, four of the candidates ultimately in the top 5 on election day were also in the top five of this poll. Beth Cashion had the same large lead she enjoyed on election day. However, at polling time 42% still selected "not sure" - meaning a very large percentage of people made their decisions in the last days before the election. The below chart shows the difference in percentage of total "votes" received in the poll vs. those on election day. As you can see a larger chunk of the undecided voters swung toward two of the challengers, Stacey Anderson and myself. This is a common occurrence in elections where undecided voters choose at the end and go with new faces. This swing is what pushed Stacey Anderson ahead of Connie Wessner and into the fifth and final spot. As you can see, surveys - even in small elections - can be both informative and useful when analyzing how our elections occur and what impacts them. They provide a window into what the public is thinking, how they receive and digest information, and what tactics work when candidates are trying to communicate. As these results show, when done right they can also be accurate gauges of what the ultimate outcome will be. My hope is that this type of survey continues to be done for our elections. It would also be great if our town embraced using these tools when making large decisions - something I spoke about frequently as part of my own campaign. Not everything can or should go to a voter referendum, but getting real and meaningful citizen input before making big decisions that impact our quality of life should be a desired goal for all of our elected officials. To see the detailed data from this survey, click here. Endorsements are pretty standard fare when it comes to elections, but in Davidson they tend to be mostly person to person conversations or maybe an email sent from someone to their list of close friends. As a candidate, when it comes to getting the word out about your campaign there is nothing better than having the "neighborhood politico" put in a good word on your behalf. While those types of endorsements certainly were a big part of the process for all candidates this year, this past election also saw several "official" endorsements from organized groups and local politicians. That was definitely something new. Here are the big ones. Some of these made the news, others did not. All of them had some impact. The North Mecklenburg Chapter of the Police Benevolent Association (PBA) endorses candidates in the local towns every election season. In the past, they have endorsed people of all political stripes from one end of the spectrum to the other. This year they endorsed myself and Vince Winegardner. If there was anything unusual about this endorsement, it was that not a single incumbent even agreed to meet with the group. That struck me as odd considering that their only question this season was around improving communication. That's it. It was in the invite, and there was not anything controversial about the interviews. Why incumbent commissioners would not want to even sit down with a group to talk about issues seems strange to me, but then again maybe that's why the only question on their list involved improved communication. The endorsement came with some adds in local media including the Huntersville Herald, Lake Norman Citizen, and DavidsonNews.net. After the PBA endorsement which was expected. The rest of the endorsements this season all fall into the "unprecedented" category. That's where things get interesting. 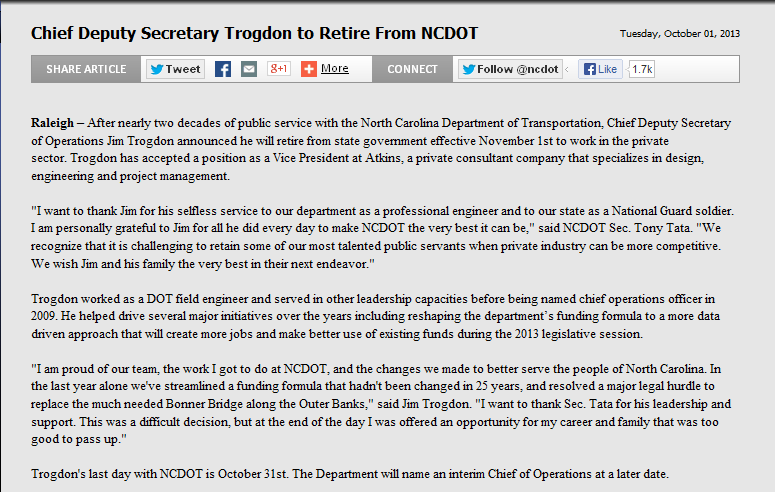 The first one that made a big splash was the TollFreeNC/Widen I77 endorsement. These activists have been fighting the plan to add HOT lanes to I-77. Fortunately for us here in Davidson, the splash was mostly in Cornelius and Huntersville where the group went negative and posted signs asking voters to "fire" some candidates while posting other signs asking them to vote others into office. In Davidson, we only got the endorsement signs. Personally, I am glad about that. The results here were definitely a mixed bag though. Two endorsed candidates won and two lost. Interestingly, the two who lost were also the two who were most vocal in their opposition to HOT lanes. The two who won included the candidate who got the most votes - Beth Cashion. Read into that what you will, but it would seem to mean that the HOT lanes issue just did not resonate with voters as much as many people thought it would - myself included. As early voting started, former Commissioner Laurie Venzon endorsed three non-incumbent candidates. The near immediate response was Mayor John Woods endorsing all of the incumbents. Mayor Woods's endorsement definitely got more attention with both DavidsonNew.net and the Huntersville Herald actually publishing the Mayor's endorsement message. But which one carried more weight? Beth Cashion came in a strong first. Stacey Anderson became the first challenger to knock-off an incumbent since 1997 when she came in fifth edging out incumbent Connie Wessner. I started with arguably the lowest name recognition and came in seventh, but only a few dozen votes behind the pack. All of the incumbents received less votes than they did in the last election - some received considerably less. While not a true apples-to-apples comparison because there was one more candidate this election season, it would appear that a former commissioner's endorsement may have influenced more people than the sitting mayor's. That says something. Then finally, there was the "endorsement" that may have had more actual impact than any other. On November 1st just days before the election, the River Run Property Owner's Association encouraged residents to "learn" about the two neighborhood candidates - Stacey Anderson and Vince Winegardner. This received basically no publicity, but it made a difference. Why was this possibly the most influential? Find out in the next post on polling. 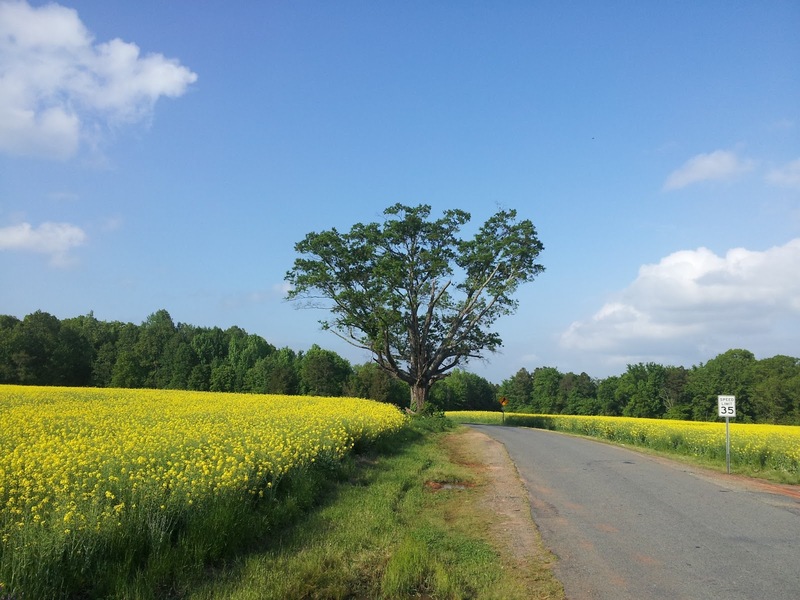 Davidson's past election season went "mainstream" with many diversions from the so called "Davidson Way" resulting in a contest that was both competitive and healthy for the town. Two new faces, Beth Cashion and Stacey Anderson, will grace the dais this coming term. New ideas and approaches to governing will be discussed. There will be more balance on the Board of Commissioners. All of these things should be good for the town if handled correctly. All of these things should help more Davidsonians feel more connected to the town. How did we get here? How did these "un-Davidson" campaign tactics impact how we elected our new crop of officials? The first thing that appeared which is not something done normally here in town was the use of campaign signs. Several candidates used them this cycle, myself included. There were not too many of them. They were not placed in public right of way along the roads. They were not negative signs, or large signs, or ugly signs. In fact, every campaign sign was placed in a yard by a candidate because the homeowner either asked for them specifically or accepted if a candidate asked. I could have used twice as many as I purchased because that many people asked about having one in their yard. The other candidates who used signs mentioned similar stories. There were also more creative signs. I had a couple of large magnets on my truck which came in handy when I was walking neighborhoods. Multiple people mentioned seeing them either around town or parked at the neighborhood entrance when I was going door-to-door. Commissioner Wessner also very creatively turned her bicycle into a rolling billboard by attaching a campaign sign and then regularly parking her bike along Main Street. Contrary to popular belief, signs apparently are not the public nuisance many believe them to be. Compare all that to the "Vote Yes" signs supporting the education bonds on the ballot. Those were larger, more visible, and placed all over town (often in public right of way against town ordinance). At the candidate forum at Town Hall, I actually helped Bill Russell of the Lake Norman Chamber of Commerce unload a trunk-full of them to give to Mayor Woods for distribution. It tells you that campaign signs are "OK" as long as they are the right signs - meaning signs supported by town hall. Signs for non-approved/non-incumbent candidates? Not so much. ...but that's for another post. Sad and disappointing best describes the ongoing revolving door between government and the private sector relative to the massive transportation projects impacting the North Mecklenburg region. See previous coverage of this stomach churning phenomena reported in these pages here, here, and here. With continued coziness between senior public officials and the consultants who are really driving these decisions, can any reasonable resident really believe they have our best interests at heart? Here's another example from last month. 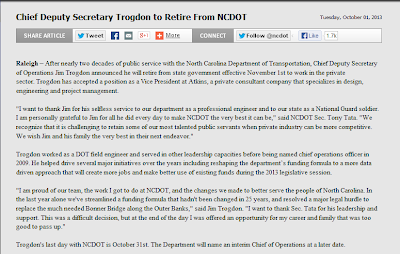 Thanks to the reader who forwarded the below tidbit from NCDOT. "Atkins is currently working on the NEPA analysis for conversion of the existing high occupancy vehicle (HOV) lanes to high occupancy toll (HOT) lanes along I-77 in Mecklenburg County. Two scenarios are currently being analyzed—one is a direct conversion of the existing HOV lanes, and a second would convert the existing lanes as well as add a second HOT lane in each direction. The limits of the project are I-77 from I-277 (Brookshire Freeway) to West Catawba Avenue (Exit 28). All work will be completed in the existing right-of-way. Atkins has provided a variety of services for this project including threatened and endangered species assessments; a community impact assessment; an environmental justice analysis, noise impact, traffic operations, and air quality analyses. Our work to-date has also included development of alternatives, preliminary roadway and hydraulic design, a review of toll operations, and public involvement support." These assessments comprise a critical piece of the approval phase of the project. It is also a piece that has come under scrutiny from the Southern Environmental Law Center. This is the same organization that stalled the Monroe Bypass with legal action over that project's environmental assessment. One has to wonder if Atkins is beefing up its staff with a well connected employee in the event the project and their work faces a similar challenge? The storyline of who will replace NC Speaker, Thom Tillis, as the North Mecklenburg Representative in the General Assembly started to officially take shape this week with outgoing Cornelius mayor, Lynette Rinker (Rep), throwing her hat in the ring. Her announcement comes in the last month before she steps down to be replaced by Mayor-elect Chuck Travis. When Ms Rinker decided earlier this year that she would not seek re-election to the mayor's post, one of her stated reasons included plans to seek higher office. Speculation immediately centered on the NC House 98 seat that would be vacant with fellow Cornelian, Thom Tillis, deciding to run for US Senate. In what was surely an unintended swipe at another fellow Cornelian, NC Senator Jeff Tarte, Rinker said at the time to CorneliusNews.net “As I consider other offices that are up for up for election in 2014, it just didn’t seem right to file and run for mayor if I’m looking ahead at something else.” Rinker was elevated to mayor from commissioner when her predecessor, Jeff Tarte, decided to run for State Senate almost immediately after winning re-election as Cornelius's mayor. How Rinker's candidacy plays with local Republicans remains to be seen. As mayor her biggest achievement has arguably been carrying water for toll road supporters in Raleigh who want to widen I-77 with HOT lanes. Those supporters include NC-98 current office holder, Speaker Thom Tillis. Back in January of this year, Rinker was fairly defensive in this video at being accused of supporting HOT lanes. By the time spring rolled around, she had obviously changed her tune - casting the tie-breaker in a surprise vote on Cornelius's Board to officially support tolls on I-77. Only time will tell, but this tie-breaking vote on tolls potentially puts Mayor Rinker in the same company as former Mayor Bill Thunberg of Mooresville - meaning, a mayor who cast a tie-breaking vote in favor of a highly controversial project that did not really pass the "common sense" test. Mayor Thunberg cast the tie-breaker that effectively created the Mi-Connection cable company - a decision that has gone disastrously for the towns of Mooresville and Davidson. We all need to hope that Mayor Rinker's tie-breaker for tolls does not lead to a similar result for the entire region. Add to all of the above the fact that the battle over toll roads these past few months has in fact taken a toll on many conservative activists, and the stage is set for a closer and more interesting race than might be expected in this heavily Republican leaning district. Enter stage left, Democrat Natasha Marcus of Davidson whose campaign sent out a press release Thursday indicating her intentions towards this open seat. While any Democrat running in this district faces a steep up-hill climb, Ms Marcus will bring advantages with her. Her leadership role in local progressive activist groups will provide a base of volunteers. She knows the issues and will be able to capitalize on certain social issues if they enter the campaign. For example Precinct 206, centered around Davidson College, cast more votes against Amendment 1 last year than any precinct in Mecklenburg County except for one. Finally, she will have a solid team of people supporting her. While I don't know Ms Marcus other than to recognize her from around Davidson - often seeing her registering voters at the farmers market, I do know some of the people who will be helping and advising in her campaign. She will have a team that is both focused and dedicated. Expect them to approach this effort with a steely-eyed professionalism. Do not expect them to make any big mistakes. They write checks. More importantly, they know people who write checks. Will they be able to pull it off? Who knows? One thing is for sure, this story is going to have a number of subplots before the curtain falls next November and the first of those subplots may very well be if/when another actor shows up to give either of these ladies a primary challenge. A giant version of the Old Glory flew over Davidson's Main Street today in honor of Veteran's Day. Here are some pictures from the event as well as video of today's guest speaker - Col. Quincy Collins of Concord. Another election came and went this past week here in Davidson, and to say the least, it was an interesting one. We had a real election discussing real issues. This was not a coronation of a predetermined slate. All of the candidates were credible, and all brought something different to the discussion. We now have two new faces on the board, and the results of that will likely have a lasting effect on our town. Over the next month or so as the new Board is seated, more detailed data becomes available on who actually voted, and the town itself settles in with new leaders, we'll be doing a few post mortem stories here at aShortChronicle on what all happened this past campaign season. I hope you find them interesting, but honestly these are as much for me as anyone else. As one of the candidates I can truly say it was one of the most memorable experiences of my life. It was also incredibly positive even though I was not quite successful in making it to the Board. I don't want to forget that. So, how did this election turn out when looking at the numbers and delving deeper into them beyond just looking at who placed in the top five? Here are some nuggets. Compared to 2011, the electorate this election cycle remained amazingly stable both in total numbers of voters as well as where that turnout originated. Some of that is good, some is still a bit disappointing. Turnout % for precinct 206 is probably artificially low this year due to the large number of additional students who registered to vote in the Amendment 1 referendum last year. When you take out registered voters with college addresses, voter turnout % in Precinct 206 was almost identical to Precinct 127 - coming in at 26.9%. Since Davidson College students almost never vote in the town's municipal elections, this more accurately reflects how the town's two precincts compared. Davidson voters from Iredell County once again almost all stayed home. In 2011 7 voters from the Davidson Pointe neighborhood voted. This year only 17. It will be interesting to watch this neighborhood in coming elections now that it is almost fully built out and actually has hundreds of voters. If they ever decide to go to the polls, those voters could have a dramatic impact on the outcome. Competitive best describes the outcome this cycle. Only 144 votes separated 3rd through 7th place. I placed 7th, but considering my status as a newcomer to Davidson I am actually thrilled to have gotten this close. 953 people voted for the "new guy", and I can not thank them enough for having the confidence to cast a vote for me. One takeaway to glean from that goes back to the first article David Boraks wrote on DavidsonNews.net when I filed to run. (See Rick Short enters Davidson commissioner race.) In this piece DNN clearly points out how I have challenged the Town Board on issues. After this election, I'd say the real takeaway is that a strong plurality of voters ultimately voted for a person who has consistently challenged the Town on issues and decisions. Combine that with the facts that another challenger, Beth Cashion, received by far the most votes and a third challenger, Stacey Anderson, was also elected, and there seems to be a clear indication that the town is willing to accept new ideas along with new faces. Where did candidates get their votes? The above chart shows where each candidate got their votes between precincts 127 and 206. The totals do not include the handful of absentee or curbside votes each candidate received, so they differ slightly from the grand totals for each candidate. Precinct 206 covers voters primarily from the Village Area and 127 covers mostly East Davidson. As you can see, the four incumbents skewed strongly towards the town center while the four challengers drew more evenly from both precincts. This idea of "skew" was first covered here after the last Davidson election. In the 2011 election, Commissioner Wessner had the largest skew. This time she came in sixth. The heavy dependence on one part of town was likely a contributing factor in that result. Two other things jump out from this chart. The first is that Beth Cashion had by far the smallest skew and received by far the largest number of votes. That is a very positive thing for our town to have our next Mayor Pro-Tem enjoying such a broad base of support. The second is somewhat ironic. This year Commissioner Fuller had the largest skew - pulling nearly two thirds of his vote total from one precinct. It is ironic because his campaign slogan was "a single community with many neighborhoods". It appears that campaign slogan did not quite result in the balanced election-day totals that it would imply. Certainly, and unfortunately, most people did not vote in this election. One can take that as a sign that most people are happy with how things are running. Or, it could be taken as a sign that people just don't care. Or even worse, they think it doesn't matter. Regardless, more people need to go to the polls. But what about those of us who did actually go to the polls? How many of us did not vote for the full options on the ballot - meaning the undervote? Who did not cast five votes in the Commissioners race or vote for Mayor Woods in the Mayor's race where he ran unopposed. The Commissioners race had about a 20% undervote this year while Mayor Woods received a 23.4% undervote when write-ins are included. Read into that what you will. However, it definitely says there is a portion of the electorate who did not feel they had a full slate of options to their liking, so they chose not to vote for the candidates on the ballot. If anything, that means there is room for more candidates next time. Somewhere along the campaign trail I heard the above quote repeated by Larry Ellison of the Oracle Corporation. It was in an interview with Charlie Rose. In a nutshell, it sums up why I decided to run for office in Davidson, and it is why I will sleep very well tonight even though things did not turn out as I would have liked. Truthfully, what would keep me up at night would be knowing I had done nothing if I had decided not to run. I can not begin to truly thank the volunteers and supporters who helped me along the way. Humbling is the most appropriate word to describe the experience of having people give of their time and enthusiasm in trying to help me achieve this goal. If there is any disappointment for me, it is because we were not able to quite get over the hump, and I know they share in that disappointment. However, there are also a number of things to be very proud of with this election, and in no way do I regret a minute of the time it took or a drop of the effort expended. I know this town better than I ever would have otherwise, and my life is richer for the experience. Finally, to the other candidates in the race I want to say thank you as well. We did not agree on a number of things, but the campaigns remained civil. That is how it should be. We had a real honest to goodness election in Davidson, and that's great for our community. My hope is that it sets the tone for elections to come. Congratulations to those who were successful. You all earned it! To those of us who did not make it, I know we'll all continue looking for ways to help in our community. That's a great thing too. As for what's next for me personally? A few days off, and then it's back to what I loved doing before this election season. aShortChronicle will be back up and running soon enough! Early Voting Starts This Week! Will you help get out the vote? The past two weeks have been a flurry of activity in the election for Davidson's Town Board of Commissioners - three public forums, lots of door knocking, and informal gatherings with voters to talk over town issues. Now, this Saturday early voting begins, and this is where you can make the most difference. On the campaign trail this election season I was reminded of how fortunate we are to be able to go vote when I met someone from China studying at Davidson College. He was fascinated at the idea that anyone could choose to run for office and that people could get together to openly discuss local issues - things we take for granted. In past elections I have had the privilege to be a precinct judge on election day and have seen first hand the power of individuals. In events like our municipal elections, you can actually see the streets where one person makes a difference. Most streets have few (if any) voters who turn out, then there will be streets where many people vote. That happens when one person encourages their friends to go to the polls. Sometime over the next 10 days, I ask that you do the same. Talk to your neighbors about this election. Send them an email encouraging them to vote during early voting or on November 5th. You can see my qualifications and positions at the bottom of this message. I will certainly be grateful if you encourage people to cast a vote for me, but definitely encourage them to vote. Our local municipal elections allow the individual the most influence of any aspect of our electoral system. I truly hope you will take advantage of it. Here are your closest early voting locations. Polls open Saturday (10/26) at 10am. If you would like copies of the below palm card to hand out, please let me know. It has been a while since the last post here at aShortChronicle, but I wanted to pass along information about some endorsements the campaign received last. week. Below is the text from an email distributed to those following the campaign's progress. Hello Friends, Volunteers, and Davidson Voters! I want to pass along a quick update on how the campaign is going and let you know about two endorsements that came in this week. In a word, things are going "great!" Recently, volunteers helped distribute over 1000 flyers to launch the campaign's outreach efforts. Also, I have personally knocked on over 200 doors in various neighborhoods. My message when talking to voters has been well received, and together, these efforts have reached neighborhoods all across town. I am confident that with your help in spreading the word we have a very good chance at being successful in November. This week, I received two endorsements that I would like to tell you about here. The first endorsement comes from the North Mecklenburg Chapter of the Police Benevolent Association (PBA). The PBA supports our local law enforcement officers and works to raise awareness of issues affecting members of our local police departments. From the PBA press release it states this endorsement comes from a "willingness to be a working partner in our efforts to improve and promote the local and state law enforcement profession." This year the PBA had only one question for Davidson candidates. Would we be willing to help with more frequent and regular communication with senior Town Staff? Working in a large corporate environment, I fully understand the importance of frequent and consistent communication in an organization. I will strive to make this happen and am committed to supporting strong communication between the Town and all of the various constituencies in our community. The second endorsement this week comes from the WidenI-77 and TollFreeNC groups working to stop the implementation of High-Occupancy Toll (HOT) Lanes on I-77 and across the State. When picking candidates to recommend, their press release says "we’re confident these candidates are the ones ready to stand up and fight for us." I appreciate these dedicated citizen-activists recognizing my commitment to fighting wasteful spending and working for effective decisions when it comes to our transportation infrastructure. I am ready to stand up for the 53% of Davidson respondents who described the widening of I-77 with tolls as "not at all important" on last year's National Citizen Survey - a survey in which the Town of Davidson participated and generally scored very high marks. With your support on election day, I will have that opportunity. October is around the corner, and there will be multiple events where you can hear the candidates discuss and debate topics important to you. Click here for details on the three scheduled candidate forums. Remember, every vote counts! Please help by forwarding this email, "liking" the campaign's Facebook page, and talking to your friends about the upcoming election. Thank you, and I look forward to seeing you on the campaign trail!!! 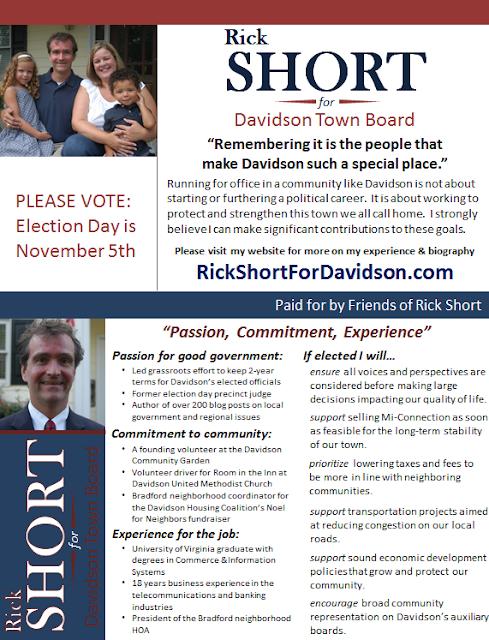 Like on Facebook: "Rick Short for Davidson"
With campaign season ramping up for the Davidson Town Board race, posting at aShortChronicle will be fairly light in the coming months. My energy will need to be focused elsewhere for the obvious reasons. But don't worry! This hiatus does not mean this effort has come to an end. There will likely be some posts on campaign related topics and as well as things that can be covered quickly. Facebook: "Rick Short for Davidson"
I wanted to pass along some news regarding a decision I have made with the support of my wife and family. You may have noticed that posting here at aShortChronicle has slowed down in recent weeks. That is due primarily to contemplating and preparing for this announcement. Today, I filed to be a candidate for election this November to the Town of Davidson Board of Commissioners. The primary reasons I decided to run for public office in our town are that I love this place we call home and want to contribute to its continued success. With the opening on the Town Board, there is a need for a strong voice willing to ask difficult questions in support of the decision making process at Town Hall. I sincerely believe I can be that voice. Over the course of my business career, including nearly a decade in the telecommunications industry, as well as through my work on this blog, I have a proven track record of success and a history of asking those difficult questions which mitigate risk by ensuring all sides of issues are discussed. These experiences will be valuable as Davidson makes large decisions in the future regarding Mi-Connection, Transportation Issues, Public Safety, and Tax Policy. I am up to the task if you decide to elect me. Since moving to Davidson, I have become deeply involved in our community and would like to continue giving back. I am an original volunteer with the Davidson Community Garden on Potts Street. Last year, at my suggestion we set a goal of 1-ton of food to be donated to Loaves and Fishes at Ada Jenkins. We met that goal. I spearheaded grassroots efforts in 2011 and 2012 to keep 2-year terms for our elected officials - an effort that helped ensure as much public input as possible in how our local government works. I currently serve as President of the Bradford neighborhood HOA where I have dealt with Town staff on issues regarding Public Works, Code Enforcement, and Affordable Housing. Through these activities and others, I know what it means to serve in this community and how our local government operates. I would be honored to serve you as a member of your Board of Commissioners. As the campaign rolls out, there will be a new website and Facebook page. Please stay tuned. However, since I have met so many of you through aShortChronicle I thought it was fitting to make this announcement here. Thank you for your support, and I will see you on the campaign trail!!! Six weeks ago after the crossover deadline aShortChronicle reported on some quiet last minute help for the Red Line Regional Rail project from the NC Legislature That help came in the form of S103 which would have extended the sunset provision on legislation critical to the Red Line, legislation that would allow Special Assessment Districts to fund a significant portion of the project. See Red Line project gets quiet boost from Raleigh. More to come? for the details. S103 barely met the deadline at crossover but appears to have come up shy in the NC House. After an interesting series of events last Thursday evening, it now appears the sunset provision will trigger and the SAD legislation will expire as scheduled on July 1, 2013. In the second reading of the bill on the House floor Thursday afternoon, the bill passed 95-14 at 4:59pm. That would have possibly set the bill up for a third reading and final passage the following Monday, July 1st - the deadline date. However, after what appears to be a flurry of activity, a motion to reconsider the second reading was brought to the floor and passed at 6:55pm by a vote of 74-14. The bill was then sent back to the Finance Committee which effectively meant there would be no third reading by the deadline date. However, when Speaker Tillis put the NC House "on ice" next week for all other business so the legislature can focus on the budget, that sealed the deal (or put the nail in the coffin) on S103 passing before the deadline. As part of that flurry of activity which lead up to the reconsidering of the 2nd reading, aShortChronicle has learned from a source in Raleigh, that many legislators were informed Thursday of the impacts of passing this legislation with regards to the Red Line. Many apparently were not aware that if this sunset provision were extended, one of its first uses would be to fund the Red Line, a project requiring a huge additional chunk of State money. As a way to validate what this source was saying, aShortChronicle can confirm that the story from this site linked above received over 3 dozen page views between the hours of 5-7 PM Thursday evening - at exactly the time this bill was being debated. While we're glad this site could help spread the word on what this legislation would really do and we're glad the legislature stalled it for the time being, we hope those same legislators won't let this same bill slip through in some other fashion. Even if S103 is now incapable of extending the sunset for these Special Assessment Districts, the same law could be reinstated as an amendment to some other bill during this legislature. Lawmakers need to remain vigilant to ensure that does not happen. 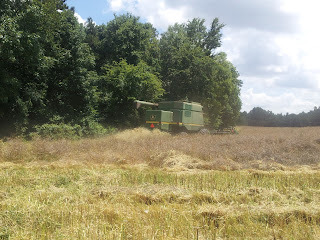 People often think of "harvest" time coming only in the fall, but in reality it goes on all year. 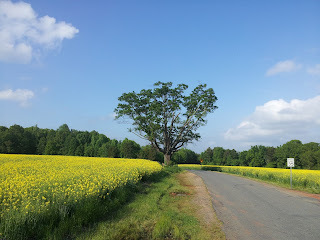 Remember those stunning yellow fields off of NC73 and June Washam Rd? Last week, with the arrival of a big green harvester, they began their journey to becoming canola oil. 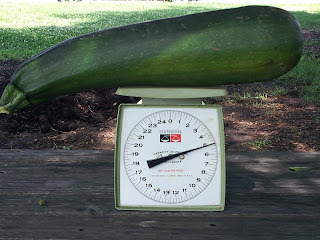 The same can be said for harvesting at the Davidson Community Garden. It goes on all year. In a recent message from garden coordinator, Connie Beach, DCG has donated over 250 lbs of produce to Loaves and Fishes at Ada Jenkins in just the past two weeks. A huge harvest of potatoes was pulled out of the ground and the recent rains have caused the squash, zucchini, and cucumbers to just explode! 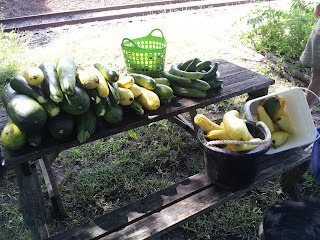 That 250lbs mentioned above does not even include the tremendous harvest of squash this week. Yes, that's a 5lb zucchini!!! The Davidson Community Garden volunteers meet every Saturday at 10am at the garden on Potts Street. Come on out and help keep bringing in the unbelievable bounty this year!